It’s well renowned that the best Halloween parties happen in Ibiza but its not just the grown-ups that can have all the fun! The Halloween events for children in Ibiza are an absolute ball. We round up where to celebrate Halloween in Ibiza this year. It’s easy to get into the Halloween spirit in Ibiza. As the summer slowly draws into Autumn, there’s some really nice early winter events on the island. Decorations pop up in bars and restaurants, and you can notice the shops selling costumes. Babylon Beach has a great afternoon in conjunction with Kids in Ibiza starting from 3pm. The children can participate in traditional games like bobbing for apples, spooky arts/crafts and a treasure hunt. There’s also dance performances and thrilling entertainment. Combine this with scarily good cocktails and a delicious spooktacular special menu. Later, the bean bags come out and you’re trick or treated to an outdoor movie in the private playground. It’s free entry but fancy dress is compulsory! The HUB Halloween Family Fun Fundraiser is being held on 27th October. The event is raising funds for the Abode Project to help build schools in Uganda. The entry is €10 for adults and €5 for children and includes a free drink. There will be a market, live music, face painting, games, and a raffle, all kicking off from 12pm. Don’t miss the fancy dress competition in the afternoon. Watch out also for Chiringuito Blue who have a special Halloween themed lunch planned the weekend before the 31st. More details are promised soon. This will also feature plenty of trick or treating from Kids in Ibiza. Bambuddah Grove is infamous for its fancy-dress Halloween gala dinner in Ibiza. Last year they held the event in Pacha due to such high demand. There’s been no news this year as of yet, but we’re pretty sure they will be holding a dinner party. Pikes is opening its gates at the Haunted Hotel this Halloween in Ibiza. From 9pm be prepared for unsettling events, live performances and art installations. They’re even offering a full package including an evening meal and bar credit. Featured in the top 100 hotels of the world, Pikes never disappoints with its fantastic flair and attention to detail. 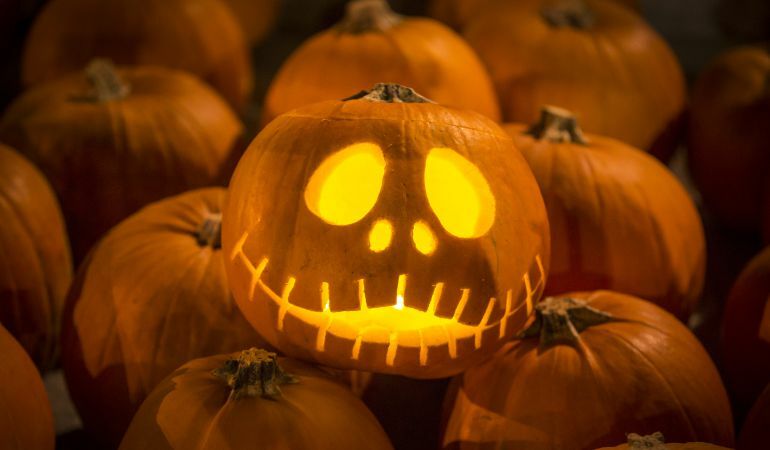 Wherever you see those pumpkins gleam, may luck be yours in Ibiza this Halloween!